Teamwork is key to the operations of the Util-Assist family. Mutual respect, cooperation, and honesty are hallmarks of our principles. We are committed to truly listening to our clients and finding the best solutions to fit each client’s unique requirements. Util-Assist hires individuals who want to participate and contribute to a like-minded team. We offer a range of energizing, multi-disciplinary careers in a high-tech industry, with great potential for development and advancement as both the industry and our company continue to grow. 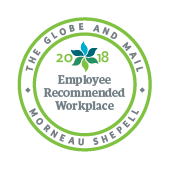 Util-Assist is always improving our policies and practices according to employee feedback, and we are proud to have been chosen as a 2018 “Employee Recommended Workplace” via a national survey facilitated by the Globe and Mail newspaper and the HR firm Morneau Shepell. The survey is designed to recognize workplaces that, according to their employees, have prioritized employee health, engagement, and workplace well-being. In addition to customer and employee satisfaction, Util-Assist holds workplace culture and community involvement as top priorities. Util-Assist regularly hosts guest presenters like health, wellness and financial experts, and we encourage employees to give presentations on topics that can benefit co-workers in their work or personal lives. We are also committed to corporate responsibility and giving back to the community, and we host company events to raise funds and collect donations for local charities. Util-Assist is committed to creating a diverse environment and is proud to be an equal opportunity employer. All qualified applicants will receive consideration for employment without regard to race, colour, religion, gender identity or expression, sexual orientation, national origin, genetics, disability, age, or veteran status. We are committed to providing a barrier-free work environment, in compliance with the Accessibility for Ontarian with Disabilities Act, 2005 (AODA). View our current employment opportunities and join the Util-Assist team today! The successful candidate will be responsible for developing business process documentation and creating business requirements for clients. Working alongside our consultants, you will travel to client locations throughout North America. Util-Assist is expanding and requires a strong Systems Analyst to assist in its growth in areas of net new systems, (design, development scope, mapping business process to systems, implementation, validation testing, and change management) management of implementations, mapping and documenting interfaces between legacy and new systems, and managing the Software Development Lifecycle, (SDLC). This position will report to Executive Management, (Practice Leads for CCP/PACE, Systems Architect, and Integration). Possess a broad knowledge of hardware, software, and programming. Coordinate application development for multiple projects. Define application problems by conferring with clients; evaluating procedures and processes. Assist in troubleshooting software application issues and identify modifications needed in existing applications to meet changing user requirements. Analyze data contained in databases and identify data integrity issues with existing/proposed systems and implement solutions. Identify opportunities that can improve the efficiency of business processes. Provide assistance and advice to business users in the effective use of applications and information technology. Participate in IT project steering committees and be involved in the design phase of any new IT software development projects. Serve as a liaison and facilitator between all business units to assist in addressing and resolving IT software/hardware issues. Ensure appropriate standards and procedures are adhered to during the development process to support a quality deliverable. Develop, supervising and documenting testing schedules for complete systems validation. Understand the software development lifecycle, (SDLC). Work closely with colleagues, developers, testers and a variety of end users to ensure technical compatibility and user satisfaction. Have the ability to learn quickly and contribute to a team effort. Possess good interpersonal and client-handling skills with the ability to manage expectations and explain technical detail. Oversee the implementation of new systems including data migration. Ensure that budgets are adhered to and deadlines are met. Have excellent oral, written, presentation, planning and negotiating skills. Keep up to date with technical and industry developments. System design, programming as well as analytical skills. Identifying and documenting systems interface requirements. MS SQL along with other flavours of SQL. Technical experience with systems, networking, databases, web development, application use and development and user support. Microsoft .NET, Visual Basic, Excel, Word, Outlook, HTML, Office Suite, Visio. Should have a minimum of 7 years of technology experience with at least 5 years as a systems analyst. Extensive knowledge of data processing, data mining, hardware platforms, and enterprise software applications. Strong background in database design, structure, and composing SQL queries. Solid project management skills with effective results focus within an information systems environment. Experience in the development and implementation of standards, procedures, and guidelines to support operational processes. Self-motivated with the ability to prioritize, meet deadlines, and manage changing priorities. Proven ability to be flexible and work hard, both independently and in a team environment, in a high-pressure on-call environment with changing priorities. Willingness to work occasionally outside of normal business hours. A results-oriented individual who thrives working in a fast paced environment. If you are qualified and interested in applying for this position, please submit your resume to HR@util-assist.com by September 12, 2018. Util-Assist is a leading consulting company to utilities, with customers throughout Canada and the United States. Our mission is to develop simplified solutions that position our clients as leaders in efficiency, innovation, and conservation. Learn more about Util-Assist at www.util-assist.com. Util-Assist’s rapid growth and expanding client base requires us to hire a Technical Writer/Project Manager. Joining the Project Management department, the successful candidate will possess transferable skills to excel in both technical writing and project management roles. Util-Assist seeks an individual who is self-motivated, well-organized and possesses excellent written and oral communication skills. Enthusiasm and a strong aptitude for acquiring an in-depth knowledge of the projects assigned, utility operations and technology are critical requirements for this role. Develop and prepare compelling submissions that respond to Requests for Proposals (RFPs). Meet proposal deadlines by establishing priorities and target dates for information gathering, writing, review, and approval. Coordinate requirements with contributors. Work with clients to re-engineer processes to provide solutions to business issues. Prepare accurate and detailed requirements specifications. Participate in consulting projects by collecting and analyzing requirements and writing final reports. Prepare attractive and stimulating PowerPoint presentations and other educational materials. Ensure quality results by developing and using templates and following company writing standards. Establish relationships with utility clients and vendors. Maintain a strong client focus, and work to understand and satisfy clients’ needs. Coordinate internal, client and vendor resources for the flawless execution of projects. Achieve business results and project discipline by effectively managing and monitoring project resources, delegating responsibilities and proactively addressing problems. Create and maintain project documentation including project budgets, scope, and charters. Ensure projects are delivered on time, within scope and within budget. Develop detailed project plans to track resources and project deliverables. Manage changes to the project scope and schedule. Facilitate productive meetings with a wide variety of audiences to drive successful outcomes. Document and manage action items, risks, and meeting minutes. Mitigate risks, and work with the project team to resolve issues. Establish relationships with utility clients and vendors. Maintain a strong client focus and work to understand and satisfy clients’ needs. Strong leadership skills, with the ability to motivate people, guide them through impediments and conflicts, and build consensus. Util-Assist is committed to creating a diverse environment and is proud to be an equal opportunity employer. All qualified applicants will receive consideration for employment without regard to race, colour, religion, gender identity or expression, sexual orientation, national origin, genetics, disability, age, or veteran status. Please submit your cover letter and resume to hr@util-assist.com with the job title referenced in the subject line. Util-Assist does not accept resumes from any source other than directly from candidates. Copyright © 2018 Util-Assist Inc.